Apple is making potentially significant changes to the search algorithm in the App Store, at least according to some app developers. If you’re a developer or publisher counting on a well-chosen name to help with visibility, things could get tougher from here on out. But if you’re a popular and well-reviewed app, things might be looking up. This could be an early step in the general revamp of App Store search and discovery that MG Siegler heard about when he broke the news in February that Apple had acquired app discovery startup Chomp. Basically, it looks like App Store search is now weighting app names and keywords less heavily in its search results. 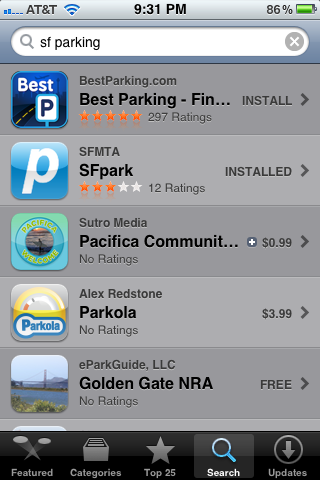 Previously, if you were searching for something like “san francisco parking”, apps whose names included those search terms would rank more highly. Or if you searched for something like “traffic”, you’d get a bunch of games with names like Traffic Rush. Now, you’re more likely to see apps that aren’t just a simple keyword match. In traffic, for example, you see more actual traffic/navigation apps — and yes, a few games thrown into the mix. We’ve heard a couple of possible explanations about why this is the case. Ben Sann, founder of BestParking.com, first tipped us off to the change, because he noticed that the Best Parking app had suddenly jumped to the top of a number of searches, including “chicago parking,” “dc parking,” and “sf parking”, in each case ranking ahead of apps that were a closer match for the search term. 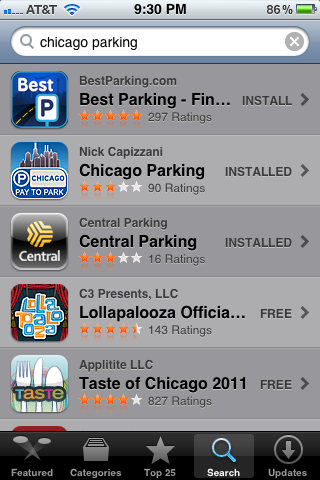 Sann’s theory: Apple is now putting a heavier emphasis on app downloads, so that BestParking has pulled ahead of apps with better names (at least, for a given search) but fewer downloads. If Sann is right, that could mean developers who built localized versions of their apps to target different search terms are going to get screwed, while more generalized apps that serve multiple geographies (like BestParking) will benefit. Matthäus Krzykowski, cofounder of app search and data company Xyologic, has another explanation. He says that Apple has been incorporating download numbers into its rankings for a while now, and he suggests that what really changed is that Apple has gotten better at “topic detection”. In other words, it’s now better able to infer what you’re looking for when you type in a search term, so if you type in the word “gas”, you probably want apps that help you find gas stations or low gas prices, rather than driving games or apps that happen to have the word gas in their title (like fart apps). His team also says that the search rankings seem to be looking at other indicators of popularity, like ratings and comments. That theory seems to be backed up by Chomp’s description of its technology: “Chomp’s proprietary algorithm learns the functions and topics of apps, so you can search based on what apps do, not just what they’re called.” In other words, if Apple is getting better at topic detection, it’s plausible that Chomp’s technology played a role. And the change doesn’t seem to be rolling out in every country. It’s hard to do an apples-to-apples comparison for different geographies, because they have different apps and different languages, but our own Ingrid Lunden says she’s seeing similar changes in the UK’s App Store search results. And Krzykowski sent along screenshots of a search for “gas” or “benzin” (German for gas) in Germany and Poland. He notes that in Germany, the results include a lot more navigation apps, while Poland’s results include more random games, suggesting that the change has happened in Germany but not Poland. In other categories, the change seems to be more subtle. I spoke to one mobile app developer who said that his apps seemed to be ranking higher in multiple categories, with some low-quality apps removed from the rankings, and the search results now matching up more closely with the App Store rankings. However, the change wasn’t dramatic enough that he could say for certain. We’ve contacted Apple and will update if we hear back.